A win today would clinch the league title. Lawns looking (and playing) great after a cut yesterday. The morning games all went to time; Betty eased ahead of Paul, but Terry found Gareth's supply of bisques too much. Doubles very tight and a close finish had Ken & Martin just scuppering Janet & David. 2 - 1 up at lunch. Things looked to be slipping away from the home side with our visitors going ahead with wins against Terry and Ken for Paul and Gareth respectively, and some time to go. Martin then found his touch and the match was all square! Janet was well ahead but Betty started to claw her way back. A tense ending with time called and a home win +1; League winners for the first time. Congratulations to all who have played in the League this season; you have done the Club proud. A doom-laden weather forecast was not totally right in the morning. Some rain which proved tricky for Betty's opponent Malcolm who was with glasses but without hat. Nevertheless a good win there, as well as Alan eventually getting the better of Graham. A very close doubles with a late home rally to win it. 2 - 1 up. Heavy rain during the lunch interval, lessening as we recommenced. But we were not to be spared. Stair-rod (seen any of those lately?) after stair-rod in biblical proportions. Bob got both balls round which was a real achievement as Lawn 1 (closest to the clubhouse) disappeared beneath the deluge. But Betty and Alan shrugged off any impediment and achieved convincing wins to record a Fylde victory. With the gods still cranking it up, Malcolm and Martin shook hands with a little way to go. Lovely day, lawns looking great, super food; what more could you want? Terry and Alan were fast out of the trap in the doubles against John and Carol. Opposition then played catch up and a tense finish ensued with a home win by a single hoop. Peter was a greyhound personified, tearing round with ball one. Sue used her bisques to get round, but Peter polished things off with time to spare. Martin and David took time to get going. Martin established a lead and held on. Three up at lunch. More sunscreen after lunch with the sun getting the better of the cloud. Terry's usual game deserted him for a while and with David grinding into a lead the solitary Bowden point was achieved by one hoop. Martin needed the effects of the pork pie to wear off before he was able to get ball one round. Sue got within sight but a comfortable home win resulted. Peter could not repeat his morning speed and accuracy, but with blows being traded, he achieved a narrow win on time. Carol's doubles performance stood her in good stead but Alan drew on his depth of experience to record the sixth win of the day. We missed the expected rain proper (a mere drizzle mostly over lunch) and as expected the lawns were fast. Ian was also fast into the fray beating Patrick by a comfortable margin. Ken found Barry in good form but was unlucky to narrowly miss out. Cat and mouse was the order of the day in the doubles. After the combos traded blows, Martin had some catching up to do and the golden hoop beckoned (for the third match running for the Fylde duo). Having won the first two, Leonard very nearly but not quite made it again. 2 -1 to Bowden at half time and a splendid hot lunch on this rather gloomy day. Ian continued his excellent current form against Barry, making it two out of two. Ken found Patrick too hot to handle, and your captain fared similarly against the redoubtable Francois. A small copse had to be laid waste to accommodate the bisques required for Brian versus Leonard, with the Fylde veteran too experienced for the home newcomer. A narrow defeat in the end, with the visitors actually coping well with the speed of the lawns. Westmorland: Tony Saville, Stephen Holmes, John Burrows, David McInnes. Fylde: Martin Bradshaw, Ian Theakstone, Alan Morton, Ken Harper. Lovely day, glorious surroundings, excellent hospitality - what more could you want? Oh yes, a win. A somewhat dour doubles, but the home pair were hoist by their own petard in ever longer consultations giving them little time to catch up the visiting pair of Ken and Martin. Ian imposed himself on Stephen in short order, but Alan and John battled away to time with John ending just the one hoop up. 2 - 1 to Fylde at lunch. Getting warmer in the afternoon and the 14 handicappers all made their mark, each winning with something to spare. Martin made heavy weather of his game and fell short. An excellent 5 - 2 win. Although there was a strong wind still blowing, the sunshine was out for the arrival of our near neighbours from across the Ribble. In the doubles, Terry was quickly into a break taking his ball to four back, although it did cost two precious bisques. Southport then mounted a steady reply with Tony and Eileen both playing well. They managed to shut Leonard out of the game and went on to win +12. In the singles, Ian maintained his current good form and dispatched John (+ 15) with plenty of time to spare. The final morning match proved to be a close encounter, Alan levelling the score as time was called. The game went to a golden hoop , with Peter keeping his nerve, to obtain another win for Fylde. After an excellent lunch, Ian was quickly into his stride again making good use of his bisques. Ian finished his game in style with a rover peel followed by his peg out. Tony played very accurately and steadily in his game against Terry taking his first ball to rover. The game then see-sawed until Terry put a winning break together and, following Ian’s example, also finished with a rover peel. The third match was also a very close encounter. Peter got both his balls to peg but lost as John made a good finishing break to peg out. In the final game, Leonard used his bisques well to take an early advantage over Eileen. However, as the bisques ran out, Eileen made up the deficit and eventually won +7. A well contested match, enjoyed by all. Under gray, scudding skies we ventured onto the excellent Pendle lawns. Ian and Ken were fast out of the blocks with Ian getting round, followed promptly by John. 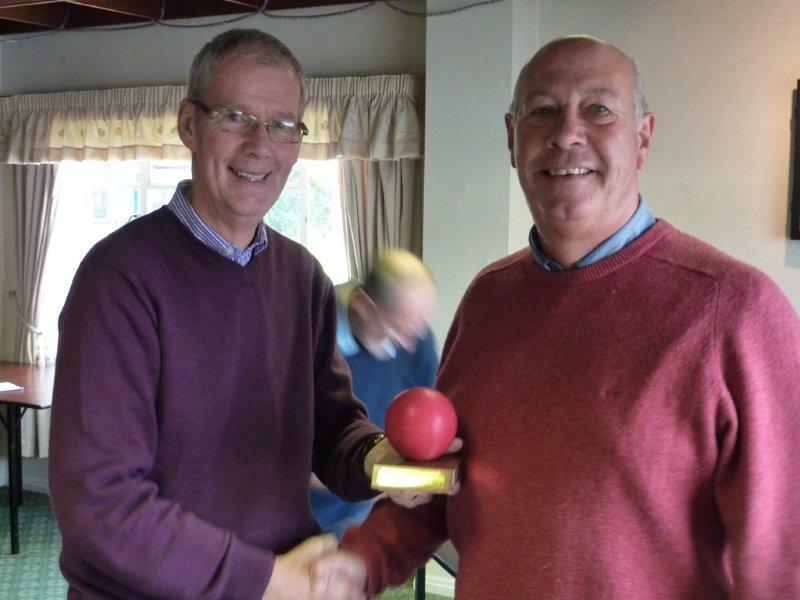 The Fylde duo kept denying Robin with Ken keeping up the good work and they ran out winners +14 with time to spare. Peter battled it out with Ron who was ahead for most of the game winning +7. Martin playing Howard was the only game that went to time. Matters were even initially but Martin had to play catch up when Howard started to draw away, and another Pendle win by +6 gave them a lunchtime (delicious) 2 - 1 advantage. Fylde got going quickly after the break with the sun shining down. Martin managed to use his bisques to advantage against John, who was not quite on his mettle, and ran out the winner +22. Peter v Howard was a very close affair with Peter sticking to the task by +2 within time. Ian was always ahead v Ron, and with Ian at peg and peg Ron decided to peg out Ian despite having a long way to go with his second ball. Ian soon cleaned up winning +10. The final game between Ken and Robin had a display of two and occasionally three balling from Robin that would not have suited the purists; but what of them, it was highly entertaining. Ken held on but time was called and Robin was victorious +3.